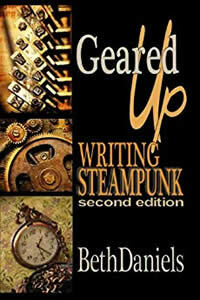 GEARED UP WRITING STEAMPUNK is a totally rewritten guide to, well, writing Steampunk Fiction. As the 2nd edition (although the title changed subtly), there are elements that remain, some that have been dropped, and new things added. For instance, this time round the research sections on wardrobes, slang, theatres, and weapons has vanished because in the original book this all focused nearly entirely on the Victorians — the British ones. Also dropped was the list of authors names, mostly because keeping it up to date in the book was impossible, so it moved to a website. The markets remained and gained a few additions. Other new sections focus specifically on Weird West, the Gilded Age (urban American East), the Belle Epoch (European), Parallel Worlds and Alternative Universes, Time Travel, plus writing the Steampunk romance, mystery, dystopian tale, comedy and adventure story. As well as covering the American West for Weird West, trips to the Canadian West, Australia, New Zealand, and Tasmania are also taken. Under the Belle Epoch section the focus is on what could be used or twisted when it comes to what’s going on historically in France and Germany. The sections on world building and collecting information to use to build that world — or the plot! — have been expanded. There are even more suggestions on what might be used or changed or mangled in dreaming up a Steampunk world for a novel, short story, or novella. For the emphasis does stay entirely on writing Steampunk fiction. There is no discussion about political messages or the Steampunk communities or Steampunk bands or costumers or crafts people. No Steampunk conventions or meet-and-greets are discussed. Likewise GEARED UP! WRITING STEAMPUNK doesn’t lay out the steps for writing fiction or building plots. There are plenty of other books that do that. MUSE TO MANUSCRIPT (by Beth Daniels), for example. Our topic is specialized and we stick to it! Comments within the reviews posted for the original WRITING STEAMPUNK book were taken into consideration during the upgrade, and hopefully solve all the problems — like hyperlinks to the various chapters being added. Steampunk is a subgenre of Alternative History which is a subgenre of Fantasy. It’s fun to read but even more exciting to write. So get GEARED UP to enjoy the ride!